Toyota has given the Camry Hybrid a full redesign for 2018, adding more fuel economy, a better look, and new infotainment. The 2018 Camry Hybrid is now equivalent to the Prius in MPG rating despite being larger and more comfortable. The Toyota Camry is the best-selling vehicle in the world right now and is one of the top five vehicles, by volume, in North America. The Camry Hybrid makes up nearly a quarter of those overall sales in the U.S. And rightfully so. Like most Toyota vehicles, this hybrid drives better than the standard gasoline option and adds huge leaps in fuel economy too. The 2018 Toyota Camry Hybrid is EPA-rated at 52 mpg combined, a full 12 MPG higher than last year. That’s into Prius territory, though we note that the higher trim levels are lower at 46 mpg combined. Even that lower number is remarkably excellent for the class. 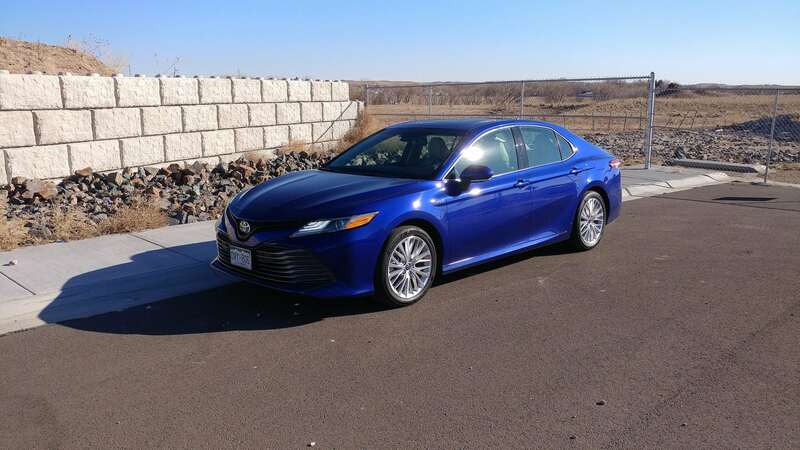 Standard equipment in the 2018 Camry Hybrid is also surprisingly good, with the base model having advanced safety and driver assistance systems on board. Infotainment is also upgraded, with a new version of Toyota’s Entune on a better screen. The 2018 Toyota Camry Hybrid is a midsized sedan offered in three trim levels. LE – As base packages go, the Camry Hybrid LE is pretty well stocked. 16-inch steel wheels, automatic LED headlamps, keyless ignition/entry, and a rearview camera are standard. As are dual-zone climate, heated front seating, and a 7-inch touchscreen with Entune infotainment. Also standard are safety and driver aids, including forward collision mitigation with pedestrian detection, lane departure warning and mitigation, and adaptive cruise control. 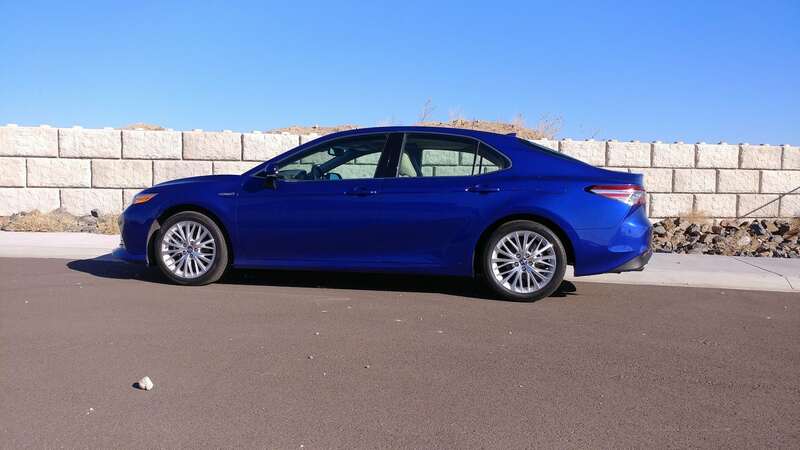 SE – Billed as the sportier option for the Camry Hybrid, the SE adds 18-inch alloy wheels, sporty styling cues (including a spoiler), tighter suspension tuning, simulated leather upholstery, and shift paddles. XLE – The high-end version of the Camry Hybrid, the XLE builds on the LE with 18-inch alloy wheels, heated exterior mirrors, an auto-dimming rearview mirror, leather upholstery, wireless smartphone charging, a head-up display for the driver, blind-spot monitoring with rear cross-traffic alert, and two added USB ports. A 360-degree camera and automatic high beams are options. 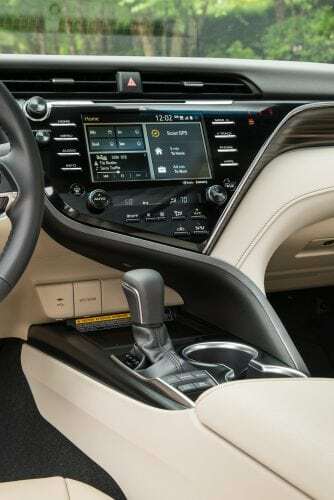 All three trims for the 2018 Toyota Camry Hybrid can have an upgrade to infotainment through the Entune Audio Plus package, which widens the screen to 8 inches, adds smartphone-based navigation, wireless charging, a 4G LTE connection with WiFi, better audio, and Toyota Safety Connect telematics. A sunroof is also available on all three packages. 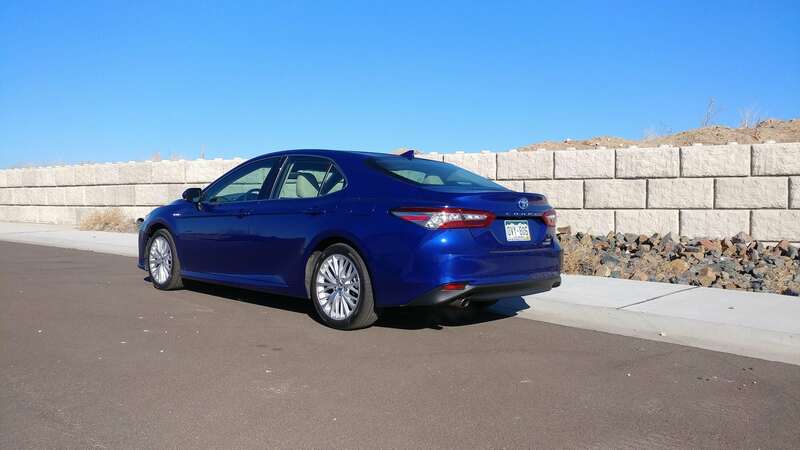 The 2018 Camry Hybrid is styled very similarly to its Camry stablemates, with a more aggressive front fascia, faster-paced styling cues, and a stronger curb presence. Toyota wants to break the “Camry is boring” mold and make it more interesting and have certainly done so with this new-generation of the car. The front fascia has a thin, slotted grille, an aggressively-designed lower intake with wide slats, and thin headlamps. The hood carries strong lines that curve slightly in a bow towards the windscreen. The roofline appears lower (though it isn’t) thanks to a tighter greenhouse and more aggressive curve to its line. Body lines are straight, but angled slightly upwards towards the rear to add more forward motion. The wheels are now pushed further to the corners as well, aiding that appearance. 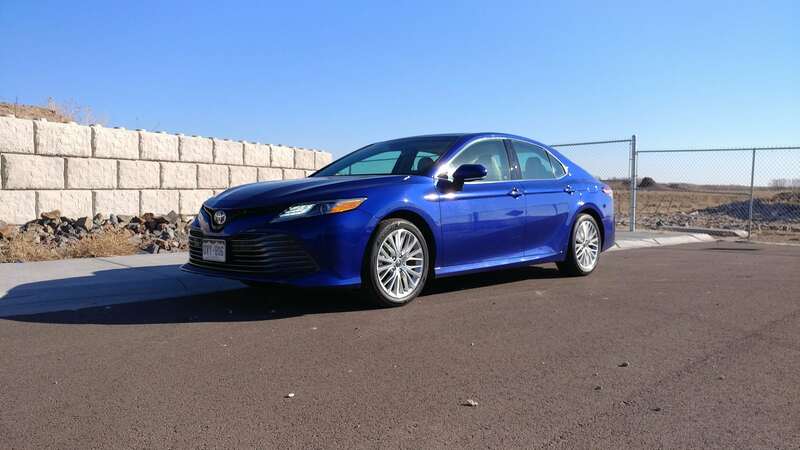 It’s a good look for the Camry and a great look for the midsize segment. On the Hybrid model, slight changes such as the Hybrid badges, blue Toyota logos, etc. are all that sets the Camry Hybrid apart from its standard gasoline options. 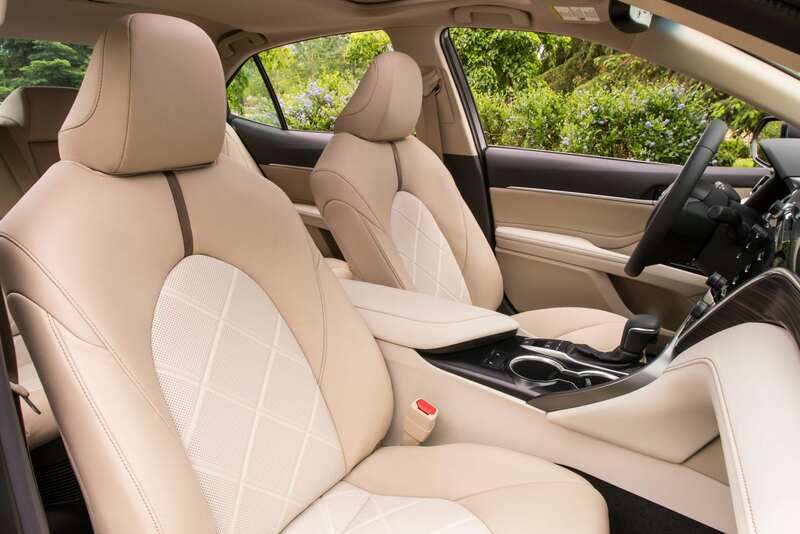 Inside, the 2018 Toyota Camry Hybrid feels roomier than it was before, with a more open cockpit appeal and more ergonomics. 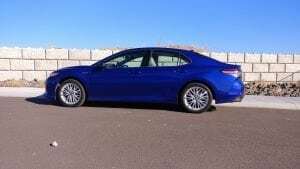 The 2018 Camry Hybrid is powered by a 2.5-liter four-cylinder engine and two motor hybrid-electric system that produces a total of 208 horsepower. A continuously variable transmission (CVT) is attached and front-wheel drive is the standard. Power delivery is very smooth in the Camry Hybrid with a solid bit of umph at the beginning that results in a 0-60 mph potential of about 7.5 seconds. That’s pretty quick for the segment, especially for a hybrid, and gives a lot of confidence when driving around town. When driving the Camry Hybrid, it becomes apparent that braking is something that has to be relearned. The combination of regenerative and regular friction braking is common in all hybrid models, of course, but in the 2018 Camry Hybrid, it requires a little finesse when at speed. Around town, the transition from one to the other is largely unnoticed and smooth. A Toyota hallmark. On the highway, however, that can change as the friction swap to friction gets aggressive at higher speeds. The driver soon learns to feather the pedal more in order to maximize regen without getting physical on the brakes. The 2018 Toyota Camry Hybrid otherwise handles very well, with smooth steering and good road absorption. The hybrid model has more weight lower to the ground, giving it a more stable feel in corners under normal and even spirited driving. 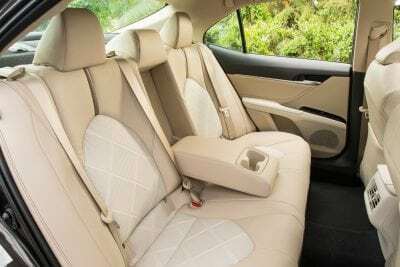 The Camry’s cabin is quiet on the highway and comfortable at all times while everyday road bumps are easily absorbed by the suspension without making it feel too soft or boring. Well done there, Toyota. The Toyota Camry has several strong competitors on the market, but the Camry Hybrid has only a few. We can unequivocally say that none of them are better than the Toyota, but two are at least close or on par. Ford Fusion Hybrid – This sedan is not as eloquent as the Camry Hybrid in interior fit or MPG ratings, but it has a lower price tag and a better drive feel overall. The Ford is much sportier, which is what sets it apart. The 2018 Toyota Camry Hybrid is easily the best in the business, as far as we’re concerned. It has everything one could ask for in a midsize sedan and adds on hybrid hyper-efficiency as well. Our complaints are few and middling, when compared to the excellence found in this midsize sedan. The Camry Hybrid was a manufacturer’s press loan for about a week. During that time, about 240 miles were put on the vehicle in varied driving conditions with various passenger loads.